HL-senteret is located in a house called "Villa Grande". During World War II, Villa Grande was renamed "Gimle" and became the residence of Vidkun Quisling, head of the National Socialist party in Norway and Hitler's Norwegian puppet government from 1942 to 1945. HL-senteret moved into the house in 2005. The property Villa Grande was earlier part of a larger estate at Bygdøy. Around 1860: The estate consisted of two villas, Grande and Ruytli. General Director Sam Eyde started the work to build the present main building. The architects were Chr. Morgenstierne and A. Eide. 1917: The present Grande property was sold to the shipowner H. Østervold who completed the building without interior decoration. Jens Z. M. Kielland was Østervold’s architect. The work on the building’s framework continued in the period 1918-1921. 1921: The municipality of Aker bought the construction together with Huk. The municipality considered using the building as a school, but it was deemed unfit. A new school was erected on the land of the Royal farm. 1928: W. Wilhelmsen gave the property to the Norwegian state. The intention was to locate the Norwegian Meteorological Institute here, but the house remained unfinished to World War II. In this period the house was an exciting and illegal playground. 1941: Leader of the Norwegian Nazi Party (Nasjonal Samling) and later Ministerial President Vidkun Quisling claimed the property and started its completion. 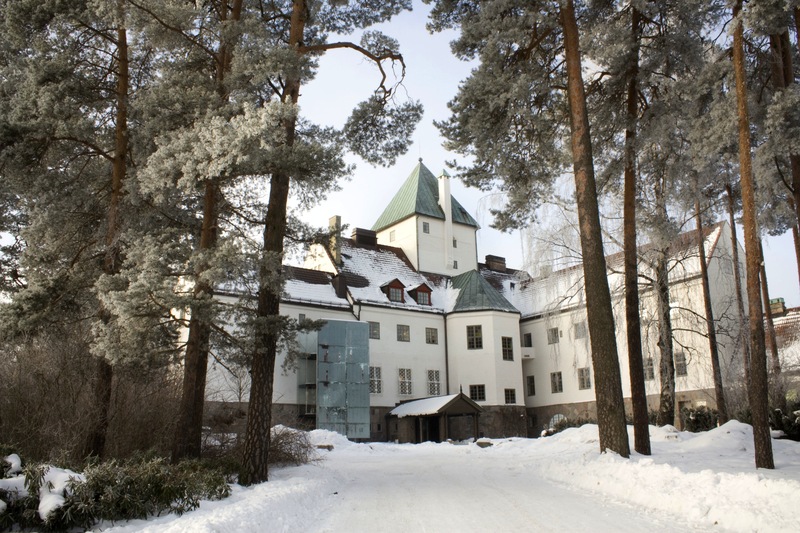 After extensive restauration, the house was renamed to “Gimle” and Quisling and his wife, Maria, moved in. From 1941 to 1945 some of the adjoining properties were confiscated and added to Gimle. 1945: From May 1945 and for approximately one and a half year, the building was an officers’ barrack for Allied troops and legations. This included diplomatic personnel. The building was thereafter no longer in military use. 1948-1961: Villa Grande was a nursing home under Ullevaal Hospital. 1963: The Norwegian government took charge over the building and it has remained in its custody ever since. Now, the National school for public health nurses was transferred here. As the school expanded, it changed its name to the National School for health personnel. The school trained midwives, district physicians and public health nurses. 1998: Teaching moved and buildings freed. 1999: Villa Grande was put on the free market for sale. The Director for Cultural Heritage proclaimed the site to be worthy of preservation. The idea to make it the location for the Center for Studies of Holocaust and religious Minorities was born. 2000: The Ministry of Government Administration and Work presents the idea of locating the Center for Studies of Holocaust and religious Minorities at Villa Grande to parliament, which in its turn agrees. 2005: HL-senteret moves in after restoration works done by Statsbygg. The building remains in governmental possession with Statsbygg Øst as its administrator.